Interests: Funky narrow gauge equipment! Looks like I'll join those of you operating Gn15 layouts some time this century! Size is roughly 3x6' ... a little less than 1x2m. 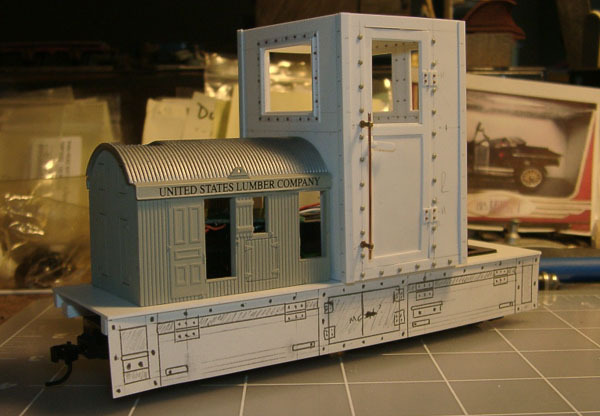 Goal for this winter is to finish the "Uncle Buck" rail truck and construct mock-up buildings for the layout to determine final placement of the different sidings. No chance of an "overnight sensation" here ... but after I hook up a few more wires, I'll have a nice place for the trains to go roundy-round while I work on various Gn15 projects! Thanks to all for the continuous supply of ideas and inspiration! That's a good looking sketch. If it ends up even half as good as what you have drawn (and knowing your high standard of modelling it will) it will be a really great layout. Can`t wait to see the progress on this Dallas. What are those to guys doing there in front of the coal cars, the guy with the hat looks like he`s giving the other guy heck, I don`t know why, he`s h armless... could not resist. Is there a still up the "Holler"? Hi Guys -- Thanks for the notes! Yes, intended to represent eastern-US coal mining ... most likely West Virginia ... which has much the same flavor as Kentucky, and similar to the EBT ... even pondering a truck-dump coal loader (like EBT) ... but probably go with a tipple. The tall structure on the right will be a tipple. All of the track is level, but the scenery rises up toward the back left corner. Center area will be elevated as well, with the road going down to a crossing ... well, at least I think so! And, of course, I'll try to find a place to hide a still in the trees! Cardstock cab to check size ... actual cab now under "destruction" ... seems the "builder" is beating it up a bit even before it goes into service! Styrene (plasticard) cab is well underway ... just needs another 80 or so rivets ... but who's counting? Further progress as time allows ... plenty of time left to pester Gerry into posting more of his great structure photos before those are needed on this layout! Uncle Buck! I loved that guy! Here's a comparison ... at top, the mock-up cab and body parts atop the S-1 mechanism ... trucks/wheels do look a bit small ... but there is a certain "charm" to the design. I got on the phone yesterday and ordered more rivets from the friendly folks at Grandt Line ... have enough to keep me busy finishing the cab and plenty of work to do on the hood and rear section. Personally I'd go for the tram skirts option, I think it makes the loco look a little bulkier. I like the one with the skirts, but I`m like that. I think one or 2 of the access panels open or broken may be a nice addition. I do think either one would blow up real good Ya real good! Nick is right about the skirt making it look bulkier. So it depends what effect you want to achieve. I would have gone without skirt, but this means the HO axle boxes need to be bulked up to look right. I would then add thick headstocks across each end, a step on each side (next to the headstock) to get on to the running board. A chunky step below the cab. And maybe even a round air tank under the cab?? - and some basic "bulked up" truck details. and they should glue straight over the top of the diesel truck axleboxes. NB the larger sandboxes easily visible on either side of the front steps. Those are mounted on the trucks! Even with excessive riveted construction, a metal skirt on such a loco somehow doesn't feel "US mining" to me. (Maybe "armoured simplex", but that's a whole different other prototype and story...). I like the bulky look of your loco and I vote for the skirts - but perhaps a little less detailed?! What size does your loco actually reach? Last edited by mad gerald on Sat Jan 17, 2009 8:20 pm, edited 1 time in total. THANKS ALL for the feedback ... much APPRECIATED! So, cut out the basic shape of those in styrene last night ... with the access panels over the trucks removed to be set in separately ... and this suggested another possible "in between" solution ... the skirts WITHOUT the truck covers suggest a sufficiently bulked up frame .... have to make some slight modifications to get a good view and play with that idea some more. One thing for certain ... full-skirting on a two-truck (twin-bogie) chassis makes it DANG NEAR IMPOSSIBLE to re-rail the thing! Did make a little bit of "actual" progress last night ... set in the pads for coupler mounting at the desired height and raised the deck to the desired level ... more when able! Thanks again for the ideas. It's a mad, mad world and I appreciate your thoughts! Yes, those rivets do look the same. I used Grandt Line #156 Rivets for most of the cab. They are .063" diameter ... and if my math is correct, that's very close to 1.5 mm. Overall length of the frame is a little over 5-3/4" long ... about 14.8 cm. Also, I experimented with a "fake" way to stamp louvers for the hood panels ... preliminary tests look good ... if it works, I'll post photos when I get that far! Dallas_M wrote: Yes, those rivets do look the same. I used Grandt Line #156 Rivets for most of the cab. They are .063" diameter ... and if my math is correct, that's very close to 1.5 mm. Dallas_M wrote: Overall length of the frame is a little over 5-3/4" long ... about 14.8 cm. What size does it reach in heigth, I mean, are your engineers supposed to drive it upright (or sitting)? mad gerald wrote: What size does it reach in heigth, I mean, are your engineers supposed to drive it upright (or sitting)? Engineer will drive it in the seated position ... I'll post some photos late tonight. Here are some more photos for Mad Gerald ... and anyone else who finds them handy! 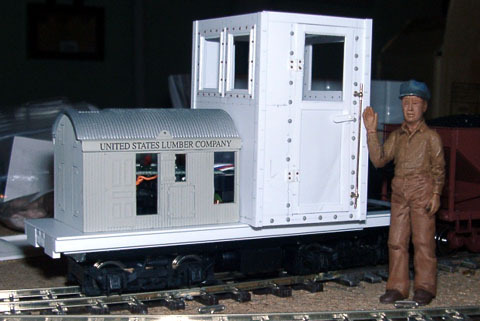 This photo shows an SLM 1/24 scale figure standing next to the loco. 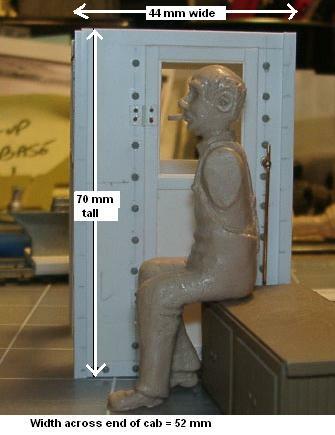 Here's a Carlo Spirito 1/24 scale figure seated on a bench in front of the cab ... gives a good idea of how he fits inside. Poor fellow has a difficult time operating the loco without any arms ... he has to bang his head on the control panel to get it to move ... then bang his head again to make it stop ... by the end of the day, he has a terrible headache ... and he can't open the bottle of aspirin! 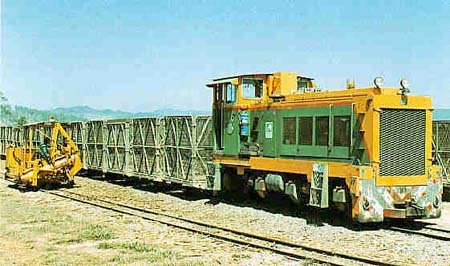 Cab measurements are shown on the photo. Now, I have a couple of late night hours to fiddle with this ... a vast array of truck (bogie) parts, journals, air tanks and what-not scattered across my workbench ... will see if I can work out the bottom half of this project ... or I might just give up and drill and install more rivets like a happy idiot! If all goes well, we'll see if we can clone some arms for that driver! Thanks Carlo, I think this guy will find a good home very soon ... and I still know where to find the bag of arms! thank you for the additional information and photos! Perhaps Carlo Spirito doesn't mind some after work chill out in a local handbangers ballroom?!?! My big and bully-minded foreman measures 8 cm - would make him a 6 footer in real life. Nice model. My instinct is that the right hand one would be easier to do on a full size jobbie, and gives more visibility for the driver, so would be the one they would have built of the two as cab front strength not a critical issue. Therefore that becomes the one to model. If driver is to be seated Gerald that's too tall - I have some half dozen cabbed Locos and all bar one (seated drivers) are 65mm in height. I should add that I work to 1/24 scale. 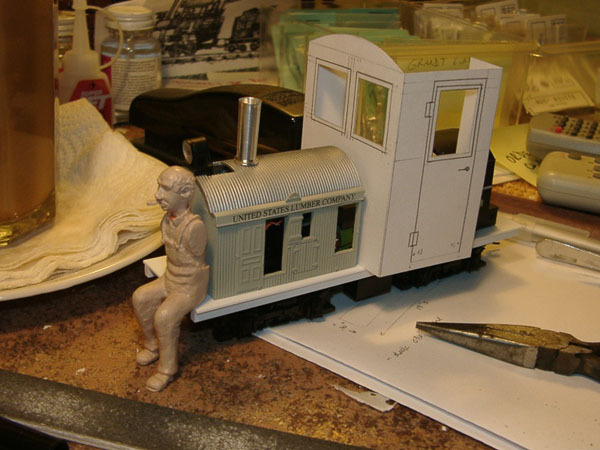 My Vitacress Loco (built to scale - again 1/24) has a cab height of 55mm and can be seen here. 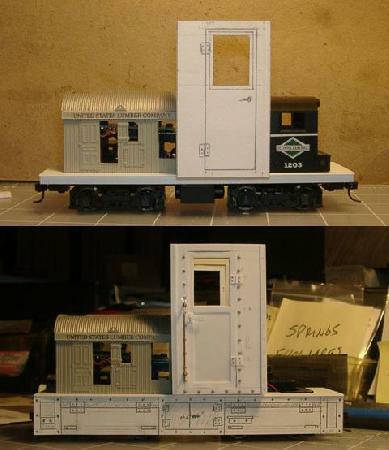 One Loco, built by Scott, has a cab height of 85mm BUT driver (1/24 scale) is standing. Just catching up with this thread. Side skirts get my vote and maybe have one cab door open or missing, that way you get some more depth/texture to the model. Nice to see you on this forum.